$30 per person for our four-course special which includes: choice of creamy cheese fondue, fresh salad, featured entrée, consisting of peppercorn filet, white shrimp, honey Dijon chicken, and feature pasta), and choice of decadent chocolate fondue. $30 per person for our four-course special which includes: choice of creamy cheese fondue, fresh salad, featured entrée (consisting of peppercorn filet, white shrimp, honey Dijon chicken, and feature pasta), and choice of decadent chocolate fondue. Enjoy 3 courses starting at $20.95 per person. Our regular menu will also be available. Enjoy 3 courses starting at $20.95 per person. Our regular menu will also be available. Plus, we'll have $4 Mimosas and Bellinis! *Make it a 4 course by adding a pick three entrée for an additional $8.00 per person. April is Customer Appreciation Month. To celebrate we will offering a special three course dinner starting at $36.95 per person. Celebrate Easter Fondue Style! We will be seating from 12-9 pm on Easter Sunday. Enjoy a 4 course meal for $39.95 per person. We will also have an egg-dyeing station available for the kids from 12-2:00. Reservations recommended. Hop on in to the Melting Pot for Easter! Enjoy a 4 course meal for $39.95 per person. We will also have an egg-dyeing station available for the kids from 12-2:00. Seating from 12-9 pm. Reservations recommended. Entree including Filet Mignon, Teriyaki Sirloin, Wild Mushroom Sacchetti, Herb-Crusted Chicken, and Pacific White Shrimp. Pamper your Mom this year by taking her to The Melting Pot! Give her what she really wants.... lots of yummy fondue! We will be seating from 1pm to 11pm on Saturday, May 11 and 12pm to 9pm on Sunday, May 12 to accommodate as many Moms as possible! Celebrate Prom at The Melting Pot. You don't have to be a Prom King and Queen to eat like one! We have a package specially designed to help give prom couples an evening to remember. Non-alchoholic specialty beverage is also included per person with the package. Each couple will have their photograph taken at the restaurant. Enjoy a featured four-course meal for two, a bottle of featured wine, a champagne toast served with the dessert course, and a souvenir photo for $100 per couple. Melt your Loved One's Heart with the Ultimate Night Out! Every Thursday we will be offering a "Date Night" Special. Enjoy a featured four-course fondue meal for two, a bottle of featured red or white wine, a champagne toast served with the dessert course, and a souvenir photo to take home for just $100 per couple. Ladies, are you looking to dip into something different? Grab your girlfriends and enjoy an evening out at The Melting Pot of Reston. Enjoy a featured four-course dinner for just $32 per person (excluding tax and gratuity). Grab your girlfriends and enjoy an evening out at The Melting Pot of Reston for a special four-course dinner. $32 per person (excluding tax and gratuity). Fabulous drink specials are always available. Monday-Friday (only at the bar! ), enjoy: cheese fondue for 2, two salads or our NEW charcuterie board, and chocolate fondue for 2 for only $39.95 a couple! Pop into the bar or patio any night of the week and enjoy a small plate and a cocktail. Whether it's our Lobster Quesadilla, Braised Beef Bouchee, or Honey Almond Brie, we have something to satisfy your cravings while you're enjoying a cocktail. Available in the bar and patio only. We also offer 50% off cheese and chocolate fondues Monday-Friday from 5-7pm available in the bar or patio only. Our way of saying "thank you" to those that serve. Military personnel and first responders and one guest receive 20% off your entire food bill, with a valid military ID/badge. *Alcohol and tax not included. Melt Her/His Heart... ....with The Ultimate Romantic Night Out package. We Stage the table for the “Perfect Night Out.” Call ahead to have the perfect table set-up for the ultimate in romantic dining. Perfect for Proposals, Anniversaries, Birthdays or Just Because. • Six of our signature chocolate covered strawberries to take home. • A delectable four-course fondue dinner for two people. Select any of our four-course featured dinners; we have 10 wonderful 4-course choices to select from. Limited seating is available and reservations are required. Please ask for The Ultimate Romance package when making your reservation. To purchase the Ultimate Romance Package for Valentine's Day the price will be $245 per couple and will include the full holiday menu for two people. Add an extra little touch to your special night if it is a birthday, graduation, anniversary, retirement or any celebration. We have several packages that can be pre-ordered and waiting on your table when you arrive. Surprise that someone special with a touch of romance package to make their evening just a little more special. Set the mood with rose petals on the table and a souvenir photo in a frame to take home. The Ultimate Romance Package includes private/premier booth seating and the following items pre-set on your table: a dozen roses in a decorative vase placed on your table, rose petals covering the table, a bottle of bubbly (non-alcoholic option available), a photograph of your party in a Melting Pot Frame, Six of our signature chocolate covered strawberries to take home. Includes a mylar balloon(choose from “Happy Birthday,”“Happy Anniversary” or “Congratulations”) attached to a teddy bear with a box of three Signature Chocolate-covered Strawberries, and a photo placed in a matted frame. Enjoy a bit of Melting Pot bliss at home. Our Signature Chocolate-Covered Strawberries are now available to go in boxes of three and six. They're prepared daily to maximize freshness and ensure the finest quality, so please call and place your order in advance. These decadent treats make the perfect gift for any occasion. Box of 3 for $5, Box of 6 for $10. This package includes a bud vase with three roses, a mylar balloon (saying either happy birthday, anniversary, or congratulations), and a digital photo placed in a matted frame. Please call no later than 4pm the day prior to your reservation to order the flower package. Includes a bouquet of balloons with a box of three Signature Chocolate-covered Strawberries, and a photo in a matted frame. Includes a mylar balloon(choose from “Happy Birthday,” “Happy Anniversary” or “Congratulations”) attached to a box of six Signature Chocolate-Covered Strawberries, and a photo in a matted frame. This package includes a mylar balloon (saying either happy birthday, anniversary, or congratulations) attached to a box of 3 Melting Pot chocolate-covered strawberries, cork screw, and a digital photo placed in a matted frame. You will also receive 20% off your first bottle of wine purchased that evening. Share the fondue moment with a Melting Pot Gift Card! Available in all denominations. For assistance in gift card ordering, please contact the restaurant. Enjoy the taste of The Melting Pot in the comfort of your own home. We sell our salad dressings, garlic and wine seasoning, chocolate wafers, and cookbook to take home. Includes a light up martini glass for the bride-to-be, a Tiara, Balloon Bouquet, 1 String of Party Beads, and a group photo in a frame for the bride-to-be. Pink or Blue Balloon Bouquet, Melting Pot onesie, a 3-pack of either pink or blue chocolate-covered strawberries, and a group photo in frame for the mom-to-be. The Melting Pot offers a Gluten Free menu recognized by the Gluten Intolerance Group (GIG.) Come enjoy your fondue favorites while following your gluten-free restrictions at The Melting Pot! We also have vegetarian and vegan options available for every course. Click to see our Vegan menu. At the Melting Pots of Reston, we believe in supporting local organizations and giving back to our community! ~ All requests must be submitted on the letterhead of the charity or requesting organization. ~ It should clearly state the purpose of the request and use of the certificate requested. ~ Only submissions sent at least 2 months prior to an event can be considered. ~ Submissions must be from potential charity partners based in the Greater Washington Area. ~ Please only one request per organization per year. ~ Please note that only a donation certificate ("Dip Certificate") will be awarded for silent auctions requests. Monetary donations cannot be awarded at this time. 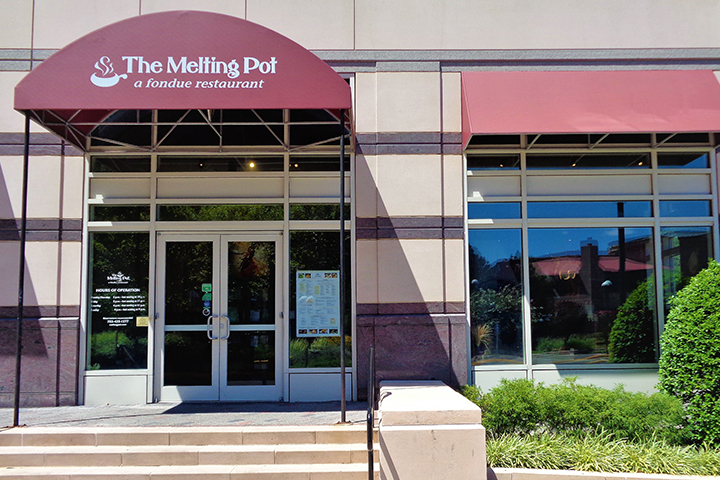 If you are an organization based outside of the Greater Washington DC Area and would like to request a donation from The Melting Pot in your area, please refer to our locations' listing at www.meltingpot.com and contact your local Melting Pot directly. Please understand that not all requests can be granted. We look forward to supporting as many as our budget will allow. Good luck! We wish all the success in your efforts.